Jeans is the new single from Chelsea Jyles, who was inspired to write the song while touring Europe, when her jeans got a little too tight. The lyrics of Jeans focus on accepting who you are and being accepted no matter what, as well as feeling totally comfortable in a relationship. The pop track was written, produced and recorded by Chelsea in her home studio. She chose simple production, building on it throughout the song, with repeated ‘Oh’s’ that begin the song, being the recognisable aspect. An acoustic guitar is introduced and an electric guitar finishes the song on a high to really capture that Chelsea Jyles sound. to over 30,000 and her YouTube videos have over 250,000 views. Chelsea is a pop singer/songwriter and has played shows around the world, including world-renowned venue The Hotel Café in Los Angeles. After working with producers in studios around Australia, she decided to produce her EP Never Land solo which was released in June 2018. Chelsea couldn’t stop writing more songs, so she began production on her second EP Get Along shortly after. It was released on January 1st 2019 and received amazing reviews. Her single House On Fire was met with outstanding feedback and gained her radio play and on-air interviews. Get Along debuted on the iTunes Albums Chart and gained thousands of streams on Spotify within a few weeks. While touring Europe in December 2018, she wrote her latest single Jeans, then produced and recorded the song by herself in only a few days. 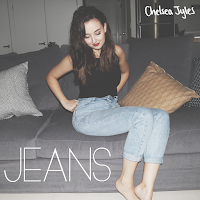 ‘Jeans’ is available in digital stores now.